How the world would look like when internet does not exist today? I’m a glass half full attitude. I think there are more people and businesses trying to do good than ever before. And with technology, helping others is easier than before, and you can do it from the comfort of your computer, or find a local event to help in person. I will say that from my perspective, the US seems more polarized, but that’s the impression the media presents. I’m not sure how real that is. I do think most people probably share some common values. They just have to get past their differences, past what other people are saying, and actually have a conversation about some of the issues we’re facing. But that takes effort, and I can appreciate that being hard for a lot of people. Anyway, I vote good outweighs the bad. Cool response. I’ve got 1 vote for “Good outweigh bad”. No doubt technology is very beneficial to our daily life in this generation and can’t see much improvement and fast pace but the missing picture is in root of the people’s heart: crime rates, bullying, protest, even cyber bullying, heartbreak, depressions are growing so much worse than the earlier. Are you sure you punched the right vote? Just saw this comparison in other thread, I feel disappointed with this rising numbers. can any of you suggest the best forex broker that can be trust and who has a good track record…? Very true. We have lost the beauty nature, we have lost the appreciation of small things, we have lost the gratefulness of what we have. Same opinion from my side. Thanks for the artificial vote. This chart is amazing, I’ve seen it and I’m disappointed as well, world has gone too much. I can’t imagine how the world would look like in next 5 years. Let’s blame Twitch, Netflix, Spotify and Whatsapp for all our problems. That’s easier than actually looking to ourselves. 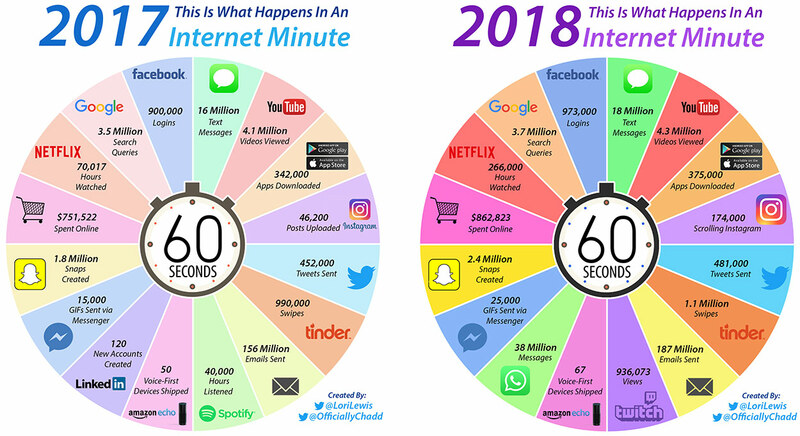 I don’t know if the rising numbers tell you anything more than tech/online stuff is being used more in 2018 then 2017. There could be many points on both the pros and cons of it. You could see that people would not be in touch with each other if there was no internet. Many businesses like cryptocurrency, forex trading, online shopping would not have existed. What are your thoughts on this issue? There could be many points on both the pros and cons of it. Without internet, our life would be slower. well, i was having this conversation with my family the other day. my parents were born in the age of no internet. they tell me there was much more emotional attachment with one another and people used to go out and hang out with friends, that’s how they were able to make real friends.obviously internet has made our lives much more easier but can’t deny the fact it also has made it hard to trust people. True that. But who would need it when internet does not exist? No one ever thought of it and lived a happy and basic life. True, our generation today is the generation of instant. Small error leave us to rate 1 star. That’s exactly how I got the views from some common movies. Thanks for sharing. They indeed had a good attachment with real emotions connected to heart and mind together. And we? We are just exchanging ideas with imaginary emotions connected to just brain. Is that how internet shaped us? Again, we must produce self-control and manage the balance. Many would have to find another way to seek “approval” for themselves. Politics would be a lot less divisive. 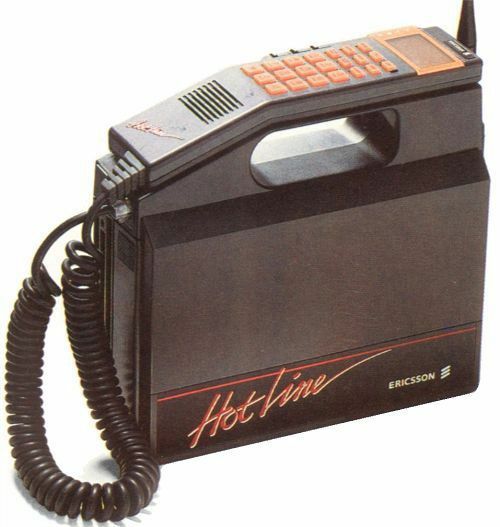 You’d be phoning your broker on one of these for a start. haha, people would be struggling where to place it, because it ain’t fit in hand pocket. What is that? Nuclear missile launch control? Don’t tell anyone the codes for nuclear Armageddon. The days when you needed extra transport just to carry a battery pack! 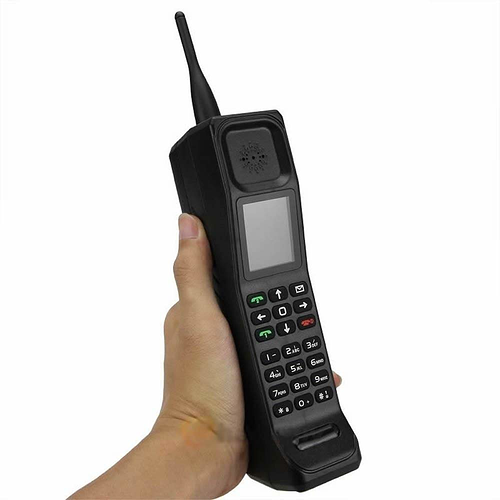 It’s hard to believe people once felt cool having a phone like that…a brick would have been more convenient to carry around with you.